PLEASE NOTE, THE CONTEST FOR THE GIFT CARD HAS ENDED, BUT WE'RE STILL ACCEPTING DONATIONS. THANKS FOR THE SUPPORT! 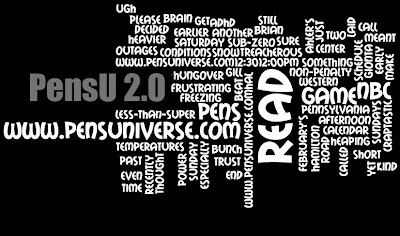 We at PENS UNIVERSE are coming up on our first birthday here in April 2010 and have decided to take the next step in PENGUINS fandom by building a website (not just a blog) that will be something every Penguin fan past and present can enjoy. Our goal is to create the best PITTSBURGH PENGUINS site available on the internet that is even more Web 2.0 savvy and all. There's even a plan to estsblish a weekly talk show, a podcast of sorts with the ability for fans to call in. More on that later. Since our inception we've been all about creating a place where fans can come and enjoy great articles while at the same time be visually stimulated with innovative (yet hilarious and antagonistic) photoshops, up to date statistics, and supberb Penguins analysis. We have even launched a store where fans can share in the likeness of their favorite one-liners, quotes, and history from the site. By establishing this cult twitter-following its only right that we continue our passion to bring you one of the greatest experiences of Pittsburgh Penguin hockey available. Having said all that, we've done all this out of the graciousness of our own free time. But since building a website does in fact cost money, we're asking for your generous gifts to help us attain our goal. Out of our own pockets we're going to take the brunt of the cost to do so, though we will need your help to bring this to fruition. While its nice to accept donations, we at Pens Universe feels its only right to give back to the very readers that make it possible to even operate. Do we make money off the t-shirts, website ads, or sponsors? We actually don't, they're partnerships that allow us to have more visibility within the hockey community. Other than that, we're just here to provide you with the best Penguins hockey experience you can get. Please take this unique opportunity to partner with us, PENS UNIVERSE. We'd greatly appreciate it. If you're reading this from a TWITTER post, please RT to get the word out. * The drawing for the shop.nhl.com gift card will be announced on April 12nd 2010. Participation is necessary, only those who donate $5 or more will be eligible for the drawing. No, you don't have to be a Penguin fan. You don't even have to like the Penguins. If you just want to donate $5 to get a chance to win an Alex Ovechkin, Mike Richards, or Henrik Zetterberg jersey feel free. Though do keep in mind that there is a very good chance we will make fun of the very player you so desire to adore.